Hi DuWayne. You are going to need 125 mils total thickness for a 1/8″ floor coating. A 100% solids aggregate filled epoxy base coat will get you up to 1/16″. It requires applying with a gauge rake and then tine rolling the coating while wet to release trapped air. It’s a minimum 2-man job and requires some experience. You will need two coat of that plus your clear top coat. If you want to tackle it yourself, we recommend calling Legacy Industrial and ask for Scotty. They are a supplier of both DIY and commercial grade product for projects like yours and Scotty can help you with selection and application. Shea – Do you think DofA is referring to a system like a resin rich system with a topcoat? The 1/8″ would be a notched rake application of a polymer concrete-type material with a seamless polyaspartic on top for color and abrasion resistance. I’ve seen this spec’d in commercial kitchens and bakeries. I live in the Chicago area. My uncoated concrete garage floor is 50 years old and is spalling over 20% of the surface area, and is progressively getting worse. What is the preferred method of repair? Is this something that could be ground and coated with a quality epoxy system? If so, what do you suppose the avg. $/sq.ft. for such a project would be for a garage size of about 550 sq. ft.
Hello Robb. We have an article about repairing spalled concrete here. You can make the necessary repairs and install a quality garage floor coating that will last for years. Cost per square foot depends on the type of system you want to install. As an example, you would be in the neighborhood of $1.50 to $1.70 per square foot, depending on cost of repair materials, for a system that consisted of primer, high solids epoxy, and a polyurethane top coat. Polyurea floor coating are going to be a little more expensive. A professional install for that type of system with repairs would start in the neighborhood of $6 per square foot as a comparison. Can these products be applied to a wood floor? Say like one of those portable garages? I need an impervious floor surface that slopes to a floor drain. If the floor does not flex, then yes, it can be applied to wood. Thanks for all the great info. Not sure why I’m still confused, but I am. So …. I have a 2500 sq ft garage. I want a nice surface for 10 cars. While I drive them all over time, there are long “sit times.” Which route do I go for best durability and look … Epoxy, Polyurea or Polyaspartic? Time of cure is not an issue …. I’ll wait if Epoxy is best. Thanks! Hello Lon. An actual hybrid system of an epoxy primer, followed by a high solids or 100% solids epoxy base coat (color flakes optional) and two coats of a polyurea or polyaspartic polyurea top coat is one of the most durable systems you can install. It provides for the best adhesion, highest build, and best top coat. Thx … is that the same as the polycuramine you describe elsewhere? No, it’s not Lon. Polycuramne is a formula that RockSolid came up with for the single coat DIY garage floor kits. It’s not U.V. stable and does not have the chemical and abrasion resistance of polyurea and polyurethane. Hello, must say first that your website is a great guide. My question is if the curing and drying time of the hybrid of epoxy and polyaspartic is also 24 hours? Hi Ceasar. Epoxy and polyurea do not dry like paint – they cure. Cure times and recoat times are different for the two. Epoxy generally is recoated within 8-12 hours and up to 24 hours. Polyurea can be recoated in as little as 1 hour depending on the formula. Epoxy can be walked on within 24 hours and driven on no sooner than 72 hours. Polyurea can be driven on in as little as 24 hours depending on the formula. Always check with the vendor or manufacturer of the products you select to determine these times. It’s almost always posted in the TDS sheets or the application instructions. Hello Dan. We’re not sure what you are looking for in terms of an answer. How thick or thin polyurea is does not dictate the performance of the coating. Epoxy can be three times as thick as polyurea, but it doesn’t make it more abrasion resistant, chemical resistant, or U.V. resistant than polyurea. Also, the pot life of polyurea can be increased or decreased depending on formulas. all polyurea is NOT polyaspartic. Several companies have polyurea based coatings using a differnt A side than a polyaspartic resin. There is a difference. Some differences is that they are usually applied thinner, have worse abrasion resistance, and have more solvent than their polyaspartic analog. Thanks Rex, that is correct and why we state it in the article. However, we didn’t want to get too far into the weeds about how different formulations of the A side resins can affect performance. Sometimes too much information can get confusing for people learning about these coatings for the first time. I just spent an hour reading through your information and comments. I think I have learned more here than anywhere else…Thanks for that. I still feel lost though. I have talked to several suppliers but they all seem to push their favorite product and bad-mouth all others. I have a NEW 450 sq ft of floor space with a southern facing overhead door. I spend my Ohio summers working on cars with the garage door open if its not raining. I had planned on a tan epoxy floor with a few light decorative chips…but the “yellowing” factor worries me, (we have just had a full month of dry 85 degree + weather). If I use two topcoats of polyaspartic or polyuria will that provide enough protection against the summer sun? I want a nice bright long lasting finish. Also, if it plays a role, just inside the overhead will be a large Mustang pony emblem. Its a DYI project, but I am fully confident with either process…just want to do it right the first time. I would consider your advice to be of key importance in my decision. Hello Dave. Thanks for the kudos and we feel your pain – it’s easy to get information overload 🙂 You are definitely on the right track choosing a polyurea or polyaspartic system if you go with both the color and clear coats. They are U.V. resistant and will not amber, even if exposed to the sun for long periods. Beware of the hybrid polyurea products for your project. These are coatings that blend epoxy and polyurea to create certain characteristics that are beneficial to DIY application, but they are not U.V. resistant. RockSolid is one such product. If you install an epoxy color coat with a polyurethane or polyurea clear coat, it will only slow down the yellowing when exposed to such conditions – it will not stop it from happening. The amount of top coats has no bearing on whether or not an epoxy color coat will amber, but it can make a difference for durability depending on how hard you are on the floor. The only time you don’t have to worry about epoxy yellowing in such conditions is if you go with color flakes to full refusal. They are made of an acrylic vinyl that will not yellow. There are a couple of DIY friendly 1-Part polyurea coatings that can make an excellent choice. One is Nohr-S by Legacy Industrial and the other is SPGX by ArmorPoxy. There are a few ways for applying a graphic emblem into a coating depending on the graphic used. We always refer to FloorPix for examples. We prefer using a polyurea top coat for these when we can since they have a much higher dry film thickness than polyurethane. You guys are great…I was expecting to wait till Monday for an answer. I have done two epoxy floors for my kids, but neither garage faced south and are normal residential use, this was the first project where direct sunlight became an issue. With your input I will be looking at a polyuria or polyaspartic application. Thanks again for the great website, quick response, useful referrals. Glad we could help Dave. Loved the info. Thank you. We hired a company to put in a Polyaspartic/Hybrid Polymer garage floor. We love it. But how do I clean so it keeps the shine? Power wash? Mop? Simple Green? 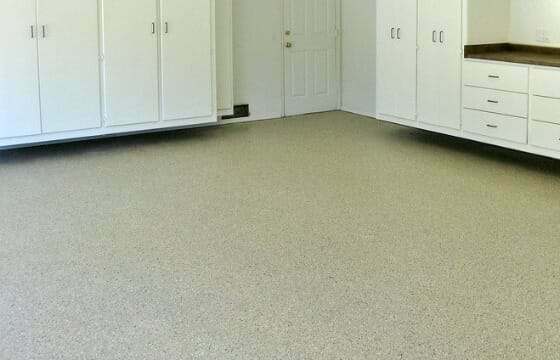 We have an article on how to clean garage floor coating right here Dea. The link takes one to an article about cleaning epoxy floors. Does the polyurea use the same method? Yes it does Cathy. Epoxy and polyurea are both resinous floor coatings that are cleaned in the same manner. How can I estimate what a professionally installed Polyaspartic garage floor will cost? I want the proper covering for resistance to hot tires, and resistance to sunlight. New pour, approx. 1000 sq. ft. I know other factors are involved like which primer based on dampness numbers (?) etc. But is there a range per sq ft? Hello Bob. Most polyaspartic systems start in the $5.50 – $6.00 a square foot range and go up from there. The polyurea is primer and seal in one but can’t go on damp floors unless you pay extra for sealer. We spent a week drying out the floor with a huge fan and dehumidifier. We have a 2 1/2 car garage, it cost $3000 from sears. Congrats Patti! Concrete floor coatings, including polyaspartic, do not respond to sanding like furniture finish. It takes the sheen right out. You had the right idea with your second guess. Sand the floor with the 120 grit to remove the imperfections and degloss the entire finish in order to apply another coat. Make sure not to whip any air into the polyaspartic when you mix it and use a premium lint free roller. Another tip is to run the roller up and down over a strip of duct tape before you use it. This will remove any of the loose lint left from trimming during the manufacturing process. Good luck! I am thinking of building a shower and using a polyurea coating insead of tile. The only dyi product I know of is Herculiner. Would that work? Or do you have a better recommendation. It seems like a fast, low cost, easy way to make a shop shower, that won’t be used that much. Thank you so much for helping all of us. It’s KIND people like you that make the world better. Hello Anthony and thanks for the kind words. Polyurea is actually used for lining liquid containers, pipes, swimming pools, and general overall waterproofing for many projects. However, most polyurea that is applied for such uses is sprayed on in order to achieve the proper mix ratios and even application. Of course the spay equipment is expensive. Polyurea for floor coatings can be applied to a vertical surface, but it cannot be applied too thickly in one application or it will sag. If you design a shower stall and seal the gaps, I’m sure you can use a polyurea coating. It would be much more expensive than the Herculiner product you are considering though. That product is an inexpensive rubberized polyurethane that should be water proof as well, though it may be tough on bare feet. Shea first off you are awesome! I want to put down 1500sq feet of a 100% solids polyaspartic floor on concrete. They will grind off the old epoxy floor but contractors are telling me I have to use a 70% polyaspartic or a polyurea on the first layer for it to bond to the concrete. Do I need a primer type layer for good bonding, and what is the best brand of polyaspartic? I plan to do a 1X6 or 2X6 trim coated in polyaspartic also. I mainly care about durability and low VOC. What would you recommend? Thanks a million for your advice. Hello Aaron. There are many brands of polyaspartic coatings that are very good. For a DIY job, GarageCoatings.com carries a few different varieties based on the job. Some can only be purchased if you are a contractor. Spartacote is and example. The reason is that 100% polyaspartic has a very short pot life and can be difficult to work with unless you have experience. The contractors are correct about using a lower solids polyrea or polyaspartic as a primer coat. The reason is to get better penetration into the substrate for a better mechanical bond. 100% solids polyaspartic is thicker and cures very fast. As a result it doesn’t penetrate the substrate as well and does not have as good a bond as the lower solids coating. I live in Wisconsin and road salt is an issue. Should I factor this in when deciding which product to use on my garage floor? Yes you should John. Your top coat selection is going to most important for resistance against road salts and deicing fluids. Be sure to review the data sheets of the product you select. Thanks for a very informative site. My question does not concern concrete floors. Can you recommend a UV resistant coating for an outdoor wood sculpture. Approximate size is 15″ x 30″ x 75″. It is made of pine with filler in the seams, sanded with 80 grit and has no finish of any kind. All corners have 3/8″ a radius and a 50 mil thickness is anticipated to render the desired appearance. Hello Lambert. 50 mils is extremely thick for a coating. Most multi-coat floor systems are not quite that thick. You could try Nohr-S by Legacy Industrial. It’s a single-part polyurea that is U.V. resistant and available in for purchase in quart sizes. It will adhere to wood sanded at 80 grit. You can apply it in multiple coats if needed. Great article, guys, I applaud you for continuing to write very well-researched articles and I love passing on an occasional article to my customers! We’ve been applying polyaspartic Coatings to garage floors and other miscellaneous areas for about 7 years now and being that we’re in North Dakota, it’s nice that there is a medium that we can use year round, and to date we’ve use Coatings in 25 below zero weather, not by choice mind you. 🙂 thank you again! Thanks for the kudos David. It’s great that you can run a year round coating business in North Dakota. Polyaspartic coatings are definitely the answer for your neck of the woods. My situation is a bit unique as I am needing to refinish a small plywood/fiberglass/ epoxy deck that has a coarse sand embedded. The surface is in good shape other that the yellowing so I think the polyaspartic maybe the best choice. Prepping the the old epoxy surface with the coarse sand is problematic though as grinding may cause damage to the lower layer of glass and sealer as the sand breaks free. Do you have any recommendations to scuff the surface? Hi Jon. The key is to degloss and rough up the existing coating in order to provide mechanical bite for the new coat. A Malish brush on a floor maintainer can work well for something like what you describe since the coating is not smooth. The stiff bristles will reach all the low areas around the course sand that provides the anti-slip properties. Regarding the new coating, you may want to contact ArmorPoxy or Legacy Industrial about product. They carry polyurea and polyaspartic coatings that are made exclusively for outdoor decking. I am a Swimming Pool Designer and remodeler; a customer told me about your product and I have reviewed your website. My question is can this be used on Swimming pool Decking and does it retain Heat? Also, with direct sun what is the time frame of it lasting and does the top coat need to be reapplied? We are in the Florida Sun but it will be enclosed in a screen room. Thanks for any information on this product. Hello Colleen. Polyurea and polyaspartic coating are not our product as we do not sell or manufacture coatings. Polyurea and polyaspartic coatings are formulated for a variety of uses, including swimming pool liners, pool decks, outdoor patios, and etc. The formulations for garage floors is not what you would want to use outdoors around swimming pools. We recommend that you contact Legacy Industrial and ask for Scotty. They are based in Florida and sell the formulas for outdoor use around swimming pools. ArmorPoxy is another vendor who specializes in such coatings as well. Hi Mandy. Yes, it would need to be either a polyurea or polyaspartic coating. The formulas used for garage floor coatings are slightly different than those used for outdoors. We suggest contacting Legacy Industrial or ArmorPoxy. Both companies carry specific U.V. proof product for use on pool decks, patios, walkways, and etc. that would be similar to what you currently have. Great site and lots of information. I am looking for a garage floor covering and am comparing epoxy vs polyeurea/polyaspartic. Based on what I see the cure time is the biggest difference. I am looking at a professional installation with either product. Is there a difference in the length of time the different options will last? Epoxy floors seem to be about half the cost. Yes, there can be a difference in how long it will last, David. That’s when it’s important to compare the technical data sheets of coatings. A properly installed commercial epoxy system that consists of an epoxy primer, high solids epoxy base coat (color coat) and a high performance polyurethane or polyurea clear coat will last just as long or longer. Floor coating systems with color chips dispersed to full refusal tend to be the most resilient. The main reason that the 1 day polyaspartic polyurea systems cost more it that the materials coat more. If you can live without your garage for a few days, a high performance epoxy system is the better deal. Just be sure to compare data sheets. Keep in mind that if you live in a cold winter climate, epoxy has to wait till the weather warms up while polyurea polyaspartic floors can be installed in freezing temps. I have just received four quotes to have our garage floor resurfaced. The first contractor gave me two quotes. One he called Epoxy only the other he called Polyaspartic only. The other two contractors said they use a Epoxy base with a Polyaspartic top coat. Our garage is about 1,000 sq. ft. Quote breakdowns are Epoxy only $3,500, Polyaspartic only $ 4,500. The two other contractors using both were $3, 700 and $4,500. All three contractors plan to grind the floor. Hello Pat. It would help to know what type of epoxy and polyaspartic products that are being used. There just isn’t enough information. Is the epoxy 100% solids? If not, what percentage is it? The same goes for the polyaspartic top coats. This is why it’s important to ask about the product being used and then ask to see the technical data sheets. This allows you to compare coating products to get an idea of how one compares to another. Also, we have an article here on how to choose a floor coating contractor. Stay away from anyone that doesn’t want to provide data sheets. They generally are using an inferior product. The first quotes are extreme for one coat of epoxy only or one coat of polyaspartic only. The quotes from the other two are closer to what it would cost for two coats (epoxy and polyaspartic top coat). A 100% solids epoxy (if that is what is being used) makes for a better base color coat than polyaspartic since it goes down thicker and takes longer to cure. The longer cure helps with penetrating into the concrete and adhering better. I see no mention of an an epoxy primer for the epoxy base. Good contractors always quote with an epoxy primer. Again, it’s hard to tell you what to think without knowing exactly what is being used. Generally, an epoxy base coat with a polyaspartic top coat is a good basic system. I had a local and reputable (checked references) contractor install Flexmar polyaspartic acid flooring in my detached 3 car garage on Feb 2 2018 for $4,000. As of today 4/29/2018, the floor is still very stinky like a nail salon. I asked the contractor and he said that he called the Flexmar folks and they said to vent it out longer. I removed all my stuff and left the garage door open for 48 hours with the outside heat of 65-82. It still smells very badly. I called the Flexmar Rep to ask his opinion and he said that they have not sold product to this guy for 5 years. When I asked the contractor about this he said he used the same product, just not the name brand. I wanted to make the space a nice area for my home gym and kids to practice wrestling in, now nobody wants to be in there. What do I do? I hate confrontation and have never used an attorney. I just want the garage I paid for. Do I just wait for summer and try another week of venting it out? Hello Joshua. No, something is wrong. We are assuming that the coating has cured and is hard? Were the temperatures cool when it was first applied? The majority of the smell from polyaspartic coatings should dissipate within 24 hours of application and be completely gone within a few days to a week at the most. We know of a couple similar cases where with both, the second coat was applied too soon and the solvents from the first coat did not get enough time to evaporate. Both times this was due to cooler weather temps where the first coat needed longer to cure. This is a normal requirement when they are applied in cooler temperatures. The remaining solvents got trapped under the second coat and were slowly releasing, causing a strong and continuous odor. The only remedy was to remove the entire coating all together and then re-apply it all again. We aren’t sure if this is the case with your floor or not, but it sounds familiar. I would ask the contractor about this and also ask for the number to the manufacturer where they bought the product. Place a call to them as well and explain the situation. Now is the time to start demanding a resolution from your contractor in order for them to get things right. If they are true professionals who stand behind their installations, then they should rectify the problem. Thank you so much for you prompt reply. It was all applied in 1 day during the month of February (very cold temperatures here in Spokane and one of the reasons we went with Polyaspartic instead of Epoxy). There are areas that are thicker than others but it is very solid/hard throughout without any sticky or soft areas. I discussed that fact that my garage has been unusable for the last three months with the contractor today. He asked me to leave the garage door open with fans going for up to another month. We agreed on another week. He said that his grinder could not remove the material. Unfortunately, if he refuses to fix it I will have to have another contractor grind if off and start over. Unfortunately the material is on the side walls too and I had trim installed/painted/caulked ( 2 months ago) to cover the seam as I was assured the smell would be gone soon. I will give it another week with my garage door open and fans on but 4 months without a garage seems outrageous. Yes, it sounds more and more like what we described. It’s most likely an application error by the contractor and it should be fixed. The coating could still be leaching fumes from a bottom coat that has not cured for weeks or more. Regardless of what has caused the problem, a professional would know that what you are experiencing is not right. It sounds like they are just trying to buy time in hopes that the problem will eventually fix itself or you will give up and go away. It’s also possible that they didn’t use the correct materials in the first place since they were not truthful about using Flexmar name brand materials. I would ask to see the technical data sheets for the products used to identify the manufacturer. If the contractor still stalls or refuses to fix the problem, we recommend getting the manufacturer involved (if you can figure out who it is) and to file a complaint with the Better Business Bureau. They can also advise you of your legal rights for your particular State. So it turns out that the company did in fact switch products and used PolyKoat instead of Flexmar. He has since ground off all of the old product but is now going to apply Polykoat gl100as he has never had this happen before. It was applied about 6 hours ago and it still smells. He has not applied the sealer coat yet. (tomorrow) I think. I appreciate that we didn’t have to go to court over the first offense but am now worried we are starting over again. He stated Flexmar would not sell him the product now that I called them to complain and it wasn’t their product he used. It’s amazing how much of a pain a 4k garage floor can be. The PolyKoat GL-100 is a 100% solids polyaspartic coating, Josh. So you should be getting a good product regardless. Obviously it’s not good business as a floor coating contractor to state that you are using one product when indeed you are using another. However, at least they have stood by their initial installation error by removing the old coating system and applying the new. The smell should dissipate greatly within the next 24 hours. Can polyaspartic coatings be used in a residential setting? I have a monolithic slab floor that has several non-structural cracks which are somewhat ugly. Could these cracks (less than 1/8″ wide) be filled, and then the entire floor (2300 sqft) be covered with this type of product? The floor has radient heat in it, would that be a problem? Any thoughts as to cost? Hello Jan. Yes, as a matter of fact it can be used in a residential setting. Radiant heat is not an issue, but it needs to be off 24 hours before the installation. A professional installer would make all the necessary repairs first before applying the coating. Cost will generally run a minimum of $5 per square foot and go up from there depending on how much repair needs to be done and how many coats are applied. I live in Montreal, where winter temperatures go to -30C and a lot of snow. I plan to coat exterior concrete balcony (4x10ft) and terrace (15×9). I got 3 estimates: (1st): Diamond grind, repair all cracks, 1 base coat Epoxy, full broadcast Flakes, 1 top coat Urethane – the supplier is SealChem. (2nd): diamond grind, repair all cracks, 1 color base coat polyurea 2 composites, 100% surface vinyl flakes, 1 clear topcoat 2 composites of polyurea-polyaspartic /supplier is Sika. (3rd): same as 2nd estimate but the supplier is LabSurface and the product is LabFast. The cost is comparable for all 3, it’s approx $12 (Cdn)/square foot. My dilemma is choosing the best product/supplier for exterior surfaces subject to rain, snow, temperature variations. Your advice and comments would be soooo greatly appreciated. Thanks in advance. Hi Tina. Many coatings do not do well outside unless they are formulated for it. Epoxy is one that does not do well, so you should eliminate that proposal for sure. Ask for the others to point out on the technical data sheets where it states it can be used outdoors. Also, make sure that they warranty their work for outdoor coatings as well. Hi Shea, The estimate specifies a warranty of 5 years, I will look into the TDS. Thanks for your prompt answer. Thanks! Another question: How to locate an experienced professional who will work in rural Southern Oregon? The first way to check, Jan, is to do a search for garage floor coatings using your location. We have an article here on how to choose a floor coating contractor. we have a new, east facing garage in middle tennesee. We were originally referred to premier garage for coating the garage. Now the painters are offering to do the garage with RockSolid, polycuramine as a “freebie” to make up for another error. This is residential and we don’t plan on being very rough on the floor; only cars and bikes will be parked on the floor. But we want it to stay nice for a long time. What is the difference here and should we stick with our original advice and go with premier garage or allow the painters to finish the floor with RockSolid? Hello Amanda. In all honesty (and no disrespect to painters), most painters do a poor job with garage floor coatings because they assume it is applied just like paint (it is not). We get many questions from people about how to fix their garage floor coating after a local painter or handyman had applied it. In regards to the RockSolid versus a Premier Garage garage floor coating, there is a night and day difference in the quality. The RockSolid product is a DIY kit targeted towards the home owner who wants to save money on a floor coating by doing it themselves. There isn’t anything inherently wrong with that, but what you get is a residential quality coating that is not designed to last 10-15 years or longer. We did an article on RockSolid here. It has established a reputation for poor coverage rates. Premier Garage installs commercial quality coatings, some of which include polyurea polyaspartic top coats, which is what we assume brought you to this article. A flooring system by them (or some other comparable company) will give you many more years of use over the RockSolid kit. It will be three times as thick, more scratch and chemical resistant, and it will not get a yellow tint if exposed to U.V. rays. You really do get what you pay for in coating and we always recommend going with the best coating you can afford. We highly recommend the Premier Garage coating if your budget allows it. You will get 10-15 years or more of great service instead of wondering what to do 5 years down the road when your coating is looking worn out and old.